In advanced framing, we bridge the corners with ladder blocking instead of the 3-stud corners used in conventional framing. This technique not only uses less wood, but also allows you to get insulation into the corners. The studs are spaced 24 inches on center with single top plates and the roof trusses are “stacked,” meaning there is vertical alignment, to create a direct load path. 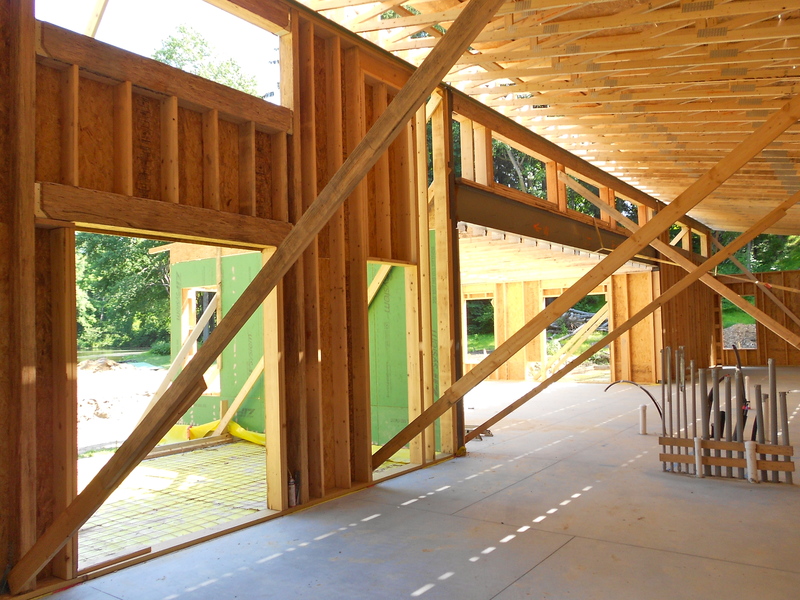 Advanced framing maximizes the wall cavity space where dense packed cellulose insulation will be blown in, reduces thermal bridging and creates a tighter building envelope. Today was the initial blower door test at the Kamp Kaolin site. With all the passive house building methods used at Kamp Kaolin, we were very excited and confident going into the test. In the above picture is David Berg (right) of DSB Energy Services and Hugh Lofting (left) are installing the frame of the blower test in a window because the door openings were too large for the frame. Kamp Kaolin came in at 0.88 air changes per hour (ACH) at 50 Pascal, which is very good! After the dense packed cellulose and dry wall are installed this number should go down. The passive house standard is 0.6 ACH at 50 Pascal. Even though the Kamp Kaolin project is not going for certification, we are striving to hit all the passive house standard milestones. 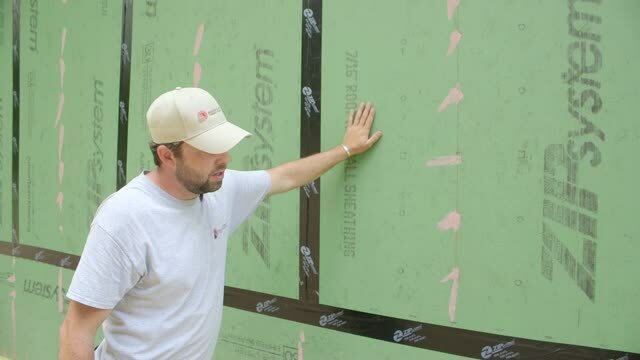 In line with passive house building principles, the airtight building envelope begins at the foundation and is continued throughout the entire construction process and the entire house. The under-slab vapor barrier, the yellow wrap, is placed on top of 2” of EPS insulation and then is covered by an additional 2” of insulation. Basically, the vapor barrier is sandwiched between 4” of EPS insulation. All of the seams are taped to insure an airtight barrier. Rebar is then installed in a checkerboard pattern to reinforce the concrete, prevent cracking, and provide structure for the PEX tubing to be attached to. Finally, the concrete is poured. The yellow vapor barrier will be taped up the side of the house, on top of the wall vapor barrier, on this project, the Zip System, to continue the building envelope. 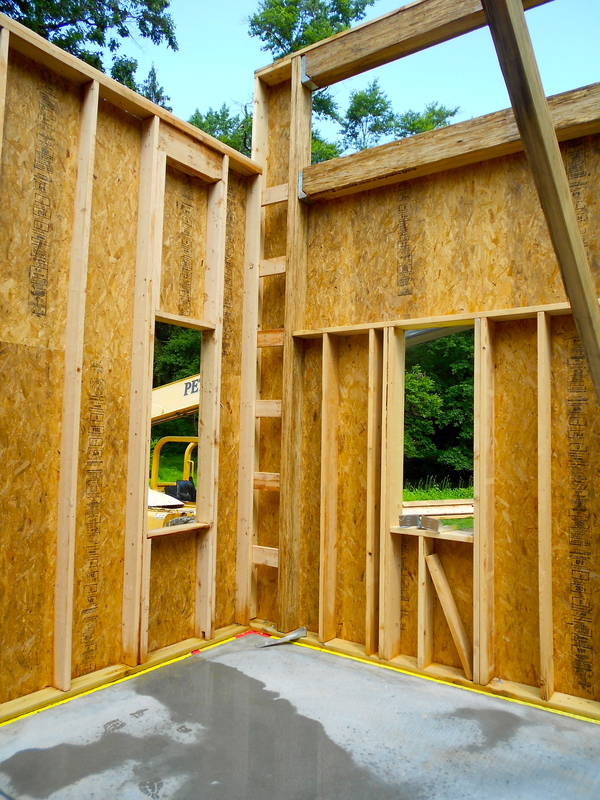 The next post will discuss our advanced framing building techniques. HJLCMS is proud to debut its first video on passive house building methods. The Kamp Kaolin Passive House Building Methods – Air Barrier video goes over the transition of window openings into the air barrier. Each component outlined in the video becomes a part of the air barrier for the entire building shell. Scheduled for completion in November 2014, Kamp Kaolin is a high-performance 2,700-square-foot private home on a secluded site in Chester County, PA. HJLCMS collaborated with the homeowners and architect Townsend Moore of Tick Hill Studios. Design and construction for the project are based on passive house principles and building science. Building science focuses on the analysis and control of building materials and building envelope systems. In this case, building science is informing a passive design. Passive houses generally achieve energy savings of 60-70 percent through super-insulation and airtight building envelopes, highly efficient HVAC systems or energy recovery ventilation, high-performance windows, and moisture control. Kamp Kaolin incorporates air and moisture barrier zip systems and super insulation as well as a closed-loop pond geothermal system for extremely efficient heating and cooling. The 2,700-square-foot house also features aging-in-place amenities (roll-in showers, single-floor living), advanced home automation systems (systems and lighting controlled via smart phones and tablets), the warm beauty of timber framing, and integration of indoors and outdoors through an open floor plan with few interior walls, an expanse of windows on the rear of the house that provide pond views, dual rear porches – one open and one screened – and natural, limited-maintenance landscaping. In continuation with the great room, I thought that it would be best to cover the loft area next. The loft consists of a sitting area and a balcony through which the chimney extends up through. The custom fireplace and chimney, made with stone found around the property, was built by Stonescapes Inc. of Hockessin, DE. The intersection of the chimney through the balcony creates a lovely, small sitting area that is a perfect spot to read a book. The loft also has a larger seating area located above the kitchen. The railings and balusters were hand forged by Harris Metalsmith Studio LLC and are simple twisted picket design, painted Satin Black with an Oak cap rail. The floors in the loft are Wormy Maple. Above the sitting are in the loft is a cupola. The cupola assists in passive ventilation. If you were not familiar with the Hansen House, you would never guess what lies beyond the beautifully handcrafted reclaimed Oak front door. Custom arched door by Shawn Hollenshead Cabinetry. As you walk in the front door and enter through the mudroom, you can either go straight towards the kitchen or go left towards the great room. The Hansen House is a hybrid house, meaning that part of it is timber framed while the rest is stick built. HJLCMS used the energy efficient method of built out walls throughout the house. Blown in insulation creates a super insulated, tight building envelope which increases the efficiency of the house. The Douglas Fir timber frame is the roof truss system above the great room, loft and kitchen. 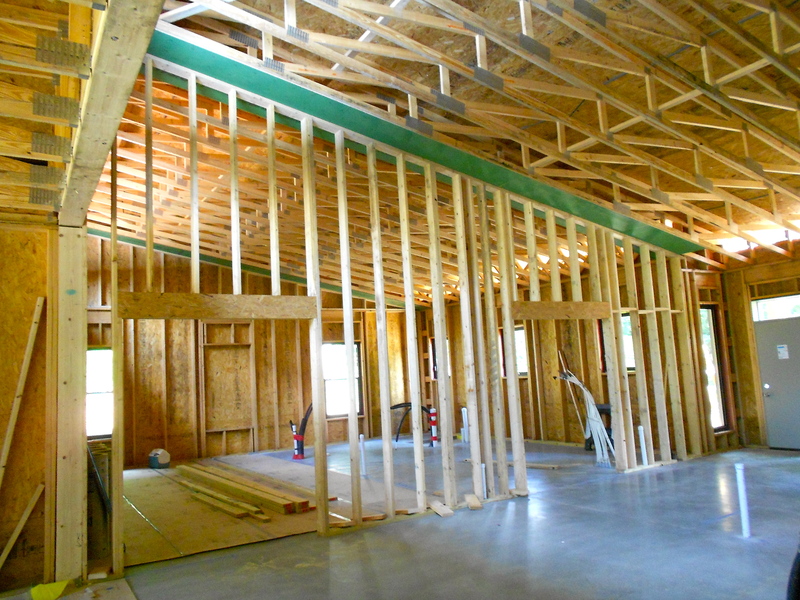 Timber framing allows for high ceilings and open building methods, not to mention that it is gorgeous. 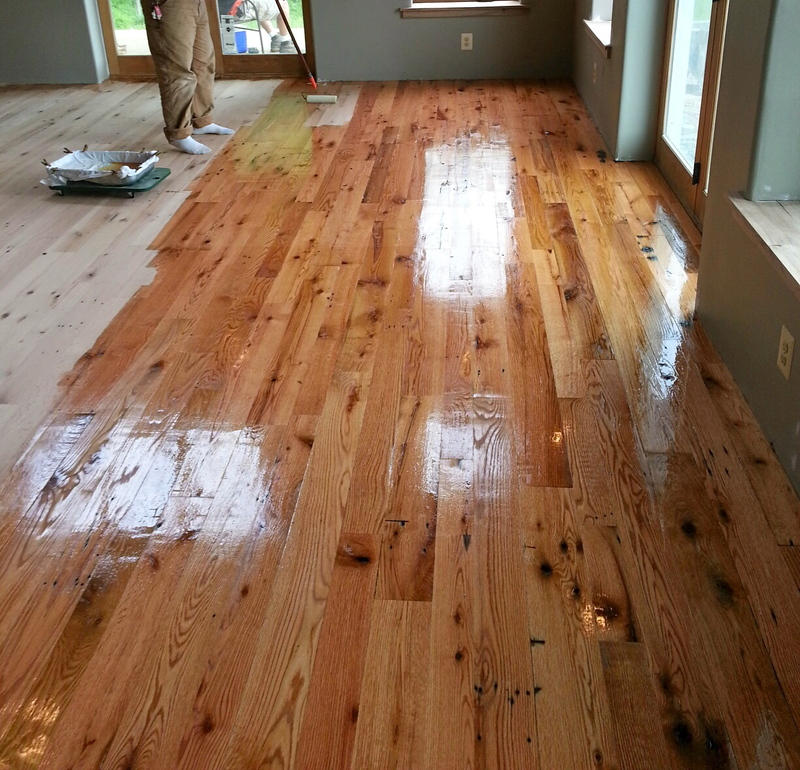 The Douglas Fir timbers are stained with Sansin clear finish and the Southern Yellow Pine roof decking is stained with Sansin Camel. Sansin is a low-VOC environmentally friendly product. The great room has beautiful views of the rural farm land that surrounds the property. The Marvin French doors are glazed to enhance energy performance. Glazing means that the window glass that has a clear coating to reflect heat while allowing light to stream in. Reclaimed Oak was used for the flooring and stone found from around the farm was used in constructing the fireplace. The workspace of the Hansen House’s kitchen is under the loft while the rest of the kitchen is open to above and out to the great room and dining area. The open ceiling allows the natural light to flow in through the windows above and all around. The flooring is ungauged slate. The slate provides a natural earthy coloring and interesting cleft textures to the floor. The back splash matches the slate on the flooring. Shawn Hollenshead Cabinetry beautifully constructed the kitchen cabinetry as well was other elements throughout the Hansen House. The flat panel Shaker doors were made out of soft maple with Sherwin Williams traditional Cherry stain with a sating sheen topcoat. All of the doors and drawers are soft close and many have custom elements that were beautifully orchestrated by Shawn Hollenshead Cabinetry. The elegant countertops are made from Uba Tuba granite. One of the unique features of the kitchen is the window seat with a built-in storage area. The window seat is part of the seating area of the kitchen that has magnificent views of the gorgeous grounds. These views extend throughout the great room, loft, master suite and guest rooms. The kitchen opens up to the dining area and the great room. Congratulations to our sister company, Hugh Lofting Timber Framing, Inc: Hugh Lofting Timber Framing Gains Passive House Certification Company recognized by Passive House Institute US as one of only seven Certified PHIUS Builders in Pennsylvania; passive house project underway in West Chester, Pa. Hugh Lofting Timber Framing, Inc. has been recognized by the Passive House Institute US as a PHIUS Certified Builder, and has a passive house under construction in West Chester, Pa. The PHIUS designation means the company understands passive house principles, has mastered craftsmanship techniques specific to passive houses, and can meet challenges specific to the North American climate. A passive house achieves overall energy savings of 60-70 percent through super-insulation and airtight building envelopes, highly efficient HVAC systems or energy recovery ventilation, high-performance windows, and moisture control. Passive construction does not employ active technologies such as photovoltaics, and can thereby be less expensive when the principles are used alone. According to the U.S. Department of Energy’s Challenge Home program, passive and active design principles used together can be the best direction toward Net Zero houses. “Hugh Lofting Timber Framing has long been committed to energy and design efficiency,” said founder Hugh Lofting. “The firm has embraced the use of FSC-certified timbers, reclaimed and salvaged woods, and environmentally aware finishes. Attaining PHIUS certification demonstrates to our clients and colleagues that we remain focused on long-lasting, energy-efficient homes and buildings.” A passive house is heated primarily by passive solar gain and by internal gains from people and electrical equipment. 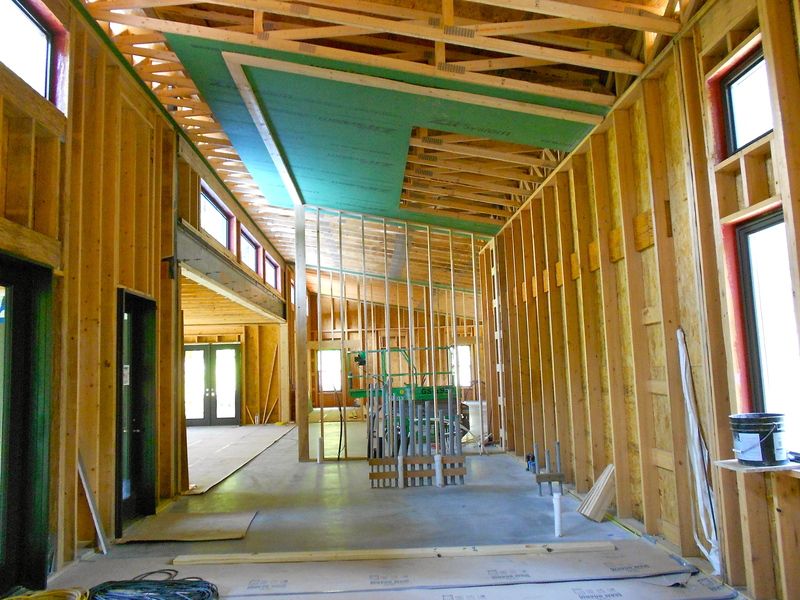 Energy loss is minimized through super-insulation and an airtight building envelope. Shading and window orientation help to avoid heat gain, which limits cooling loads. Superior air quality and comfort are accomplished with a heat/energy recovery ventilator. PHIUS Certified Builders have passed a four-day training program and a written exam. There are 45 PHIUS Certified Builders in the U.S. Hugh Lofting Timber Framing, Inc. is one of seven in Pennsylvania. Hugh Lofting Timber Framing presently has a passive house in construction in West Chester, Pa. To find out more on this project, visit the owner’s blog The Winding Path to a Simple Home. The 2,000-square-foot residence includes high-performance Intus windows and a super-insulated structure. Completion is planned for early 2014. The house will stand as a local example of passive house techniques blended with timber frame craftsmanship. About Passive House Institute US Passive House Institute US is a registered 501(c)3. The organization’s goal is to build a network of other organizations and individuals to share expertise, resources, and effort toward goals of energy conservation, sustainability, smart growth, systems thinking in design, and a higher quality of life for all. For more information visit http://www.passivehouse.us. After the tar paper was installed on the exterior of the Hansen House, the next step was to install the venting network for the siding. Venting behind siding is necessary to prevent the major problems that could arise from trapped moisture. The venting material is cor-a-vent sturdi-strip which runs vertically and cor-a-vent SV-3 which runs horizontally along the exterior of the walls. The sturdi-strips and SV-3 are crush resistant extruded polypropylene core with fluted airways that provide maximum airflow. The SV-3 has an enhanced insect screen to prevent insects from getting in behind the siding. The siding is the HZ5 product line of HardiPlank. The HZ5 products are a special substrate composition designed to perform in climates with freezing temperatures, seasonal temperature variations, snow and ice. Timber bark is the color of the siding with arctic white trim and soffits. The Hansen House has 3 variations to the exterior which give it a unique look. As you approach the house you encounter the stone wall which is a continuation of the original and existing architecture of the farm. When you walk around the to the front the stone fades away to classic siding. This continues along to the side porch. Once you get to the back and side of the garage, the siding makes the final transformation into vertical board and batten. The soffit and trim are HZ5 product line in arctic white. The cupola, where the whole-house fan will be installed to exhaust hot air from the house and for air circulation, has the same siding, soffit and trim as the rest of the house. The main roof of the Hansen House is shingled while the porches and overhangs have standing seam metal roofs.